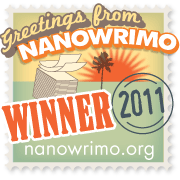 Still a long way to go on the story- about four more chapters but the NaNoWriMo stress is over for another year! Thanks Rita. Keep on working that story. Doesn’t have to be done by November 30. I look at it as words are good no matter how many. Woohoo! You got through those last 6,000 words in great time! Congratulations! Yeah. 4895 in the Saturday marathon. I kept crawling closer and kept saying 500 more til I got it. It always kills me though because the nano validator counts characters, not words that my total is always different. Like I lost over 100 words on their validator. Weird.